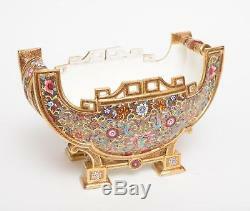 8143 Coaplort Porcelain Sleigh Shape Jardiniere. 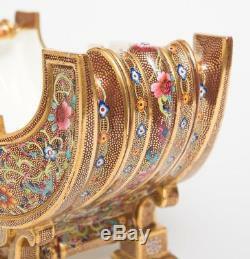 An antique mid 19th Century Coalport porcelain sleigh shaped jardiniere or sleigh vase dating around 1865. 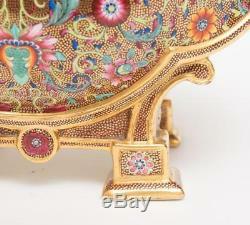 It is of very elaborate design and decoration very much in the Paris or Sevres style. 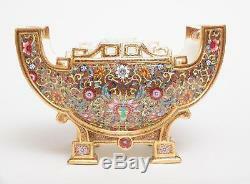 Coalport had a fairly short phase of producing these elaborate wares in the mid Victorian period taking inspiration from the continental and middle eastern styles. 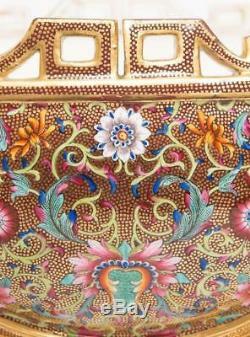 The ground is covered in hand painted gilt dots and it has multi-coloured stylised flowers and foliage. The ground colour is claret and it is profusely covered in gilt dots. The body has moulded details including scrolled handles and a pierced rim section, it really is a spectacular piece that will refuse to go unnoticed. 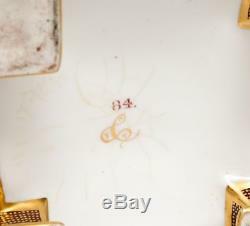 To the underside is the Coalport ampersand mark (a take on the Sevres mark) used on some of their special pieces in the mid Victorian period. 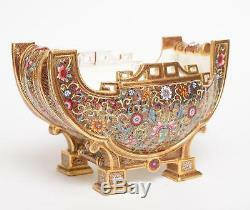 An amazing piece of decorative porcelain. Decoration remarkably good for period with just minor gilt rubbing at high spots. It has some discolouration internally through normal use. There is some discoloured crazing to the underside base. A section of the pierced rim has been broken out and re-glued and this is shown in close-up for you. Overall an impressive and stylish piece. If for any reason you are unhappy with your item please let us know as soon as possible, and we will do our best to put things right. 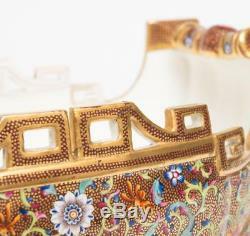 The item "An Antique Coalport Porcelain Sleigh Shape Jardiniere Vase Hand Painted c1865" is in sale since Tuesday, July 29, 2014. 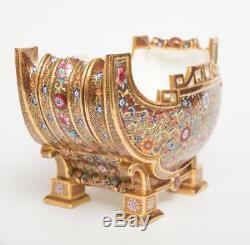 This item is in the category "Pottery, Porcelain & Glass\Porcelain/China\Coalport\Decorative/Ornamental". The seller is "chrisbuckman" and is located in Telford. This item can be shipped worldwide.